A long time ago, on a project far back in time, the team that I was part of was given a requirement to zero the disks of VMs before they were deleted by vRA / vRO (or vCAC and vCO as they were called back then). One of my colleagues on the project, Jonathan Medd, devised an approach for doing this using an “experimental” PowerCLI feature and wrote it up on his blog. This is still listed as an experimental feature in the PowerCLI documentation for vSphere 6.5. The Set-HardDisk cmdlet has the -ZeroOut option and it would still be used exactly as Jonathan describes it in his article. So, “zeroFillVirtualDisk_Task” is a method called from VcVirtualDiskManager. All we need to give it is a datastore path and a VcDataCenter object and it’ll do the rest. Getting a datastore path is relatively straight forward. 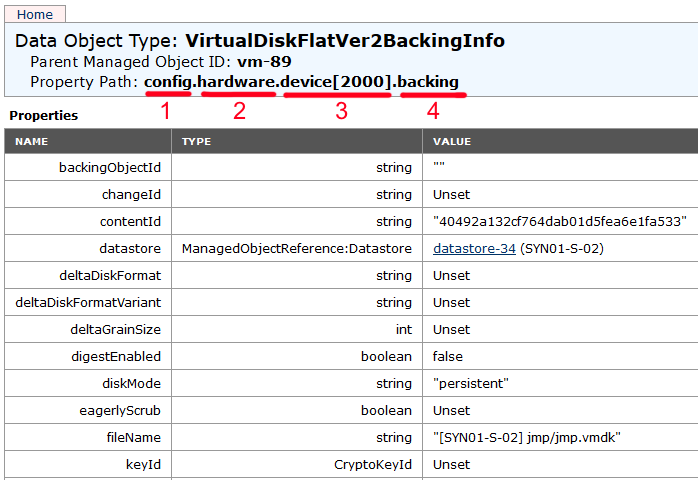 Using vSphere’s Managed Object Browser (MOB), I can pick a VM object and navigate down to the config (1) and the hardware (2), get the disk devices (3) and look at their backing (4). The fileName attribute gives me the datastore path that I need. Obtaining a VcDataCenter object, if I have the VM object already is a doddle too. There’s a vCenter plugin action that will do it for me based on the information that I have available to me in the MOB above. Taking the datastore attribute, which is a reference to a datastore object, I can pass it to the action below and get the VcDataCenter back. Line 1 – Gets the vCenter plugin connection for the vCenter that owns the VM called vm. Line 2 – Gets the VCVirtualDiskManager object that the zeroFillVirtualDisk_Task method is a member of. 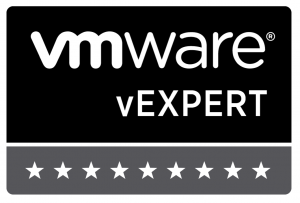 Lines 3 to 5 – Getting the config, hardware and devices for the VM. This could be done as one line. Line 9 – Starts a loop to run the following code for each device. Line 10 – Checks to see if the current device is a Virtual Disk. Line 11 – Gets the Virtual Disk filename. 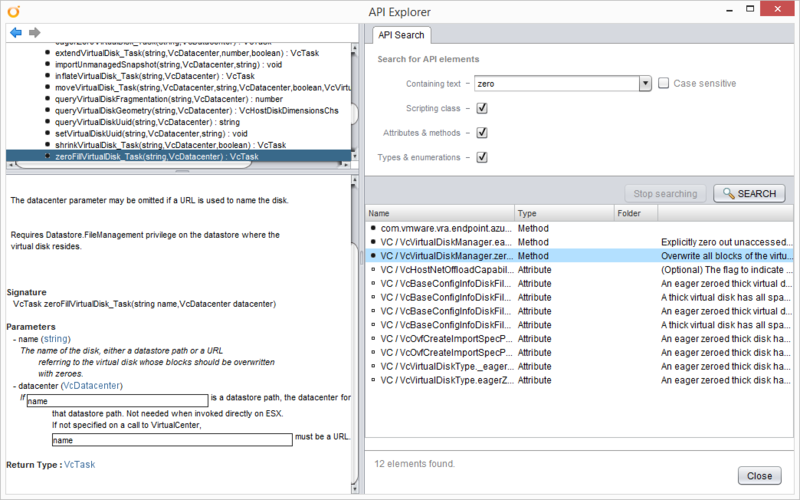 Line 12 – Gets the VcDataCenter object using the Virtual Disk datastore as an input. Line 14 – Instructs vCenter to zero the Virtual Disk. There are a few considerations aside from some minor tweaks to make the code more efficient or robust before we look at adding this as a workflow subscription in vRA. Firstly, on some storage devices (my home lab included), zeroing the disks causes a thin provisioned disk to expand to its full size. If the disks are large, you can expect the task to take some time and / or consume a lot of storage space. Secondly, if there are snapshots running on the VM, they must be removed first. Thirdly, the VM must be powered off before this will run. If the workflow subscription takes place at the right time, this shouldn’t be a problem however. Finally, as I’ve already mentioned, this process could take some time to complete. The zeroFillVirtualDisk_Task method returns a vCenter task reference. Ideally that should be monitored for completion rather than just firing and forgetting. If the VM has multiple disks, that’s multiple tasks. Taking the original script above and factoring in the considerations too, it’s possible to create a fairly simple workflow that can be added as an Event Broker subscription in vRA. I’ll post it up here soon.